Manny Charlton (b. 25 July 1941) is famous for the guitar riffs that catapulted the international Scottish rock band Nazareth to stardom during the 1970s. He played on, produced and wrote most of their greatest hits, including Broken Down Angel, Bad Bad Boy, Hair of the Dog and countless others, not to mention producing the prototype rock ballad “Love Hurts” which was a top 10 hit around the world in 1975, and stayed an unprecedented 60 weeks in the Norwegian chart. Manny Charlton left Nazareth in 1990 and has since relocated to Dallas Texas USA, where he continues to record and tour with his Manny Charlton Band. Manny Charlton has released several high-quality albums since leaving Nazareth, including “Hellacious” from 2014, which features an all-star line-up of classic rock legends, including Tim Bogert (formerly of Vanilla Fudge, Cactus and Beck, Bogert & Appice), drummer Walfredo Reyes Jr. (Santana, Traffic, Steve Winwood and Lindsey Buckingham. ), Vivian Campbell (Def Leppard), Robert Sarzo (Quiet Riot), Steven Adler (Guns'n'Roses) and a talented New York-based singer, Robyn DeLarenzo. 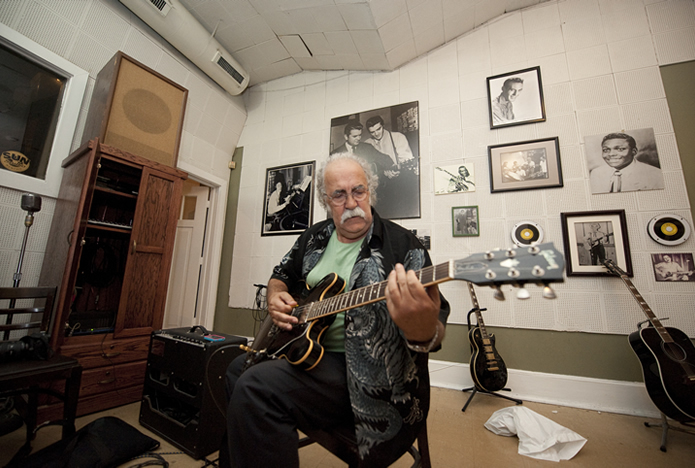 Manny Charlton was instrumental in completing the award-winning Fighting Demons album, including the recording session at Sun Studio. Not only did he play guitar, but he also engineered, mixed and produced the session. He even wrote a brand new song for the Fluffy debut album called “Can’t Stop the Rain”. Manny Charlton is currently producing the sophomore Fluffy Jackets album in Cordoba, Spain, scheduled for release in 2018. They say you should never meet your heroes, but not so with Manny Charlton.. it has been - and still is - a pleasure to work with him. It is a true honor to feature him on our songs.